Pirates, sorcerers, and witches battle for an ancient magical treasure. To the Iruk people of the South Polar Sea, the crew of a hunting boat is sacred—a band of men and women warriors bound by oath and a group soul. But when Lonn leads his crew away from the hunt to pursue his dream of a treasure ship, they find more than an easy bit of piracy. The ship belongs to the witch Amlina, and after the Iruks carry off her possessions, they are robbed in turn. Worse, one of their band is also taken—Glyssa, the woman Lonn loves. 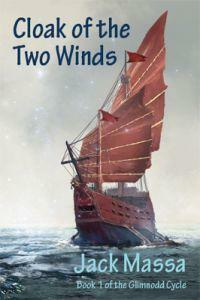 To rescue her, the Iruks must join forces with Amlina on a perilous voyage far from the seas they know. To Lonn and his mates, nothing matters but saving Glyssa. But Amlina knows much more is at stake. Among her possessions is an object of ancient power. In the wrong hands, the Cloak of the Two Winds can unravel the age-old magic that keeps the world from chaos. "Piracy! Magic! Strange creatures! Sword fights! Love! “If well-written sword & sorcery is your thing, you’ll love this novel." "Great book! I easily give it five stars for character development, pacing, and imaginative setting, adventures, and abilities." "Loved it! Great original story with plenty of action, interesting well-developed characters and unique world. I can’t wait to read the next adventure! "